We are, each one of us, faced with a choice. Jeesh - that&apos;s dark. But I&apos;m a pretty dark guy, so it fits. 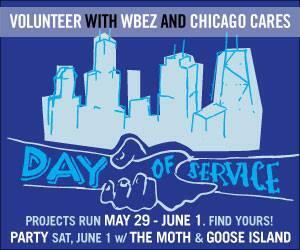 Next week, we will be launching WBEZ&apos;s Day of Service. Hundreds of volunteers from around Chicago coming together with each other to help. To be "of service." To build paper mache Peace Totem Poles. To deep clean a Ronald McDonal House. To pack and sort donated food. To brighten up the day for a group of assisted living seniors. To paint murals. Under the guidance of the extraordinary Chicago Cares staff, our volunteers will be spending four days trying to make a small corner of a neighborhood in one city in the United States of the Planet Earth a little better. At the end of four days, we will all meet at Schuba&apos;s for a complimentary pint of Goose Island Green Line and a very special edition of The Moth. If you are one of the volunteers, you get in for free and get a t-shirt, too. If not, you can grab tickets for $12.00 ($10 if you&apos;re a student). The theme for the June 1st Moth is "When I Helped" and, as I almost always guarantee the Moth audience, I can promise you at least one story that will make you laugh hard, one story that will blow your mind, and at least one story that makes you see how similar all we clever apes actually are. Then, we&apos;ll all enjoy a set by Blue Ribbon Glee Club. If you want to lend a hand, sign up here. If you can&apos;t volunteer but are a fan of The Moth, buy tickets here.